In the same category, an 8-yr-old boy about a week ago was having a hard time in his piano lesson as well. At one point when he wasn’t happy with what he just played, he said, “That was almost disgusting.” It helped that he’s not from the U.S. and hasn’t lived here that long, so his accent made his “almost disgusting” remark even funnier. Here’s the thing – some of you people need to lighten up with your piano mistakes. Sure, try to fix them and don’t make them as often. But it’s a piano lesson for heaven’s sake, not a performance. Your mistakes don’t bother me as much as they bother you, and there’s probably not a bad note you can play that I A) haven’t heard before, and B) haven’t played before. So take it easy, just play the thing with your mistakes and all, and move on. I can definitely stand listening to it, and it’s not almost disgusting. I’m here for you. Plus, I’m probably not even listening. (OK that was a joke. I am listening much of the time). Saw a good quote from Miles Davis this morning: if you’re not making mistakes, THAT’S a mistake. 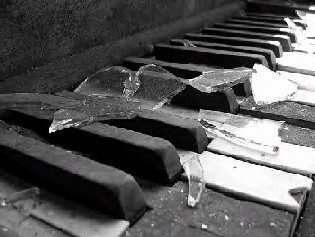 I know what’s its like to make mistakes playing the piano. I’ve done it countless times in front of an audience. Fortunately, they quickly forget all about the mistakes, or don’t even notice them. They DO however, notice if you get up at the end of your piece and trip over the piano bench when attempting to leave the stage. Fortunately for me, YouTube did not exist in 1970.